As passionate as I am about Christmas, my gift wrapping efforts always let me down. Presents get wrapped in a rush and gift tags are scrawled with less than impeccable handwriting. Perideau Designs are set to save my festive season with personalised tags, making me one very merry gift giver! Perideau Designs specialise in personalised paper goods and their Christmas line up is nothing short of superb. I have my eye on just about everything. The Personalised Gift Tags are fantastic, the ability to choose a greeting along with our name will save my handwriting embarrassment while looking very cool. There are seven charming silhouette tag images to choose from – a penguin, reindeer, giraffe, ornaments, tree, elephant and train – and a multitude of colours covering all your traditional or modern tastes. For serious gift givers, the Holiday Gift Bag is as pretty as it is practical. Like the gift tags, it’s completely customisable and perfectly sized to suit smaller gifts for teachers, babysitters and neighbours. Made from cotton with a drawstring closure, they really are a cute packaging option emblazoned with your name and choice of festive greeting. 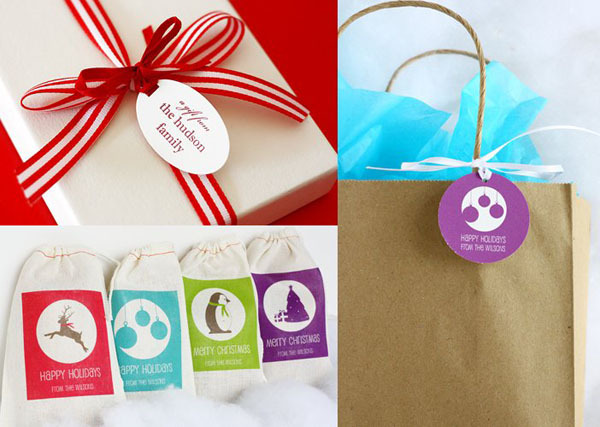 Gift tags come in a set of twelve for US$12 and Holiday Gift Bags are $24 for twelve from Perideau Designs. Delivery to Australia is available.